Warwick has been asking me for ages to write a new blog and although i do take a long time to do most things, i have been putting it off and didn’t really know why. There is so much to tell you about Henry and my head is full of thoughts about him and the other wonderful children i am lucky enough to work with now who are teaching me so much, probably more than i teach them! For those who know me finding words is not normally a problem i have to deal with!!!! How to cut them down or shut me up is normally the issue! So why have i not been able to sit down and express myself especially at such an amazing time and have kept putting it off? I think its there that i have my answer. Where we are now, who Henry is now – its crazily different. its overwhelming and awe inspiring. Taking him to school, picking him up, doing homework, going to his friends, playing games, chatting, being cheeky, its all kind of unbelievable. Sometimes things are too big. 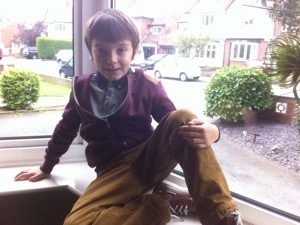 Today he has been picked up to go to his best friends birthday party looking all grown up! Bowling and McDonalds on his own! When he was writing his card I had to keep pinching myself. He chose what to write; ‘Happy Birthday Bonker Head’!! But softened it with ‘From your best friend Henry’! I was with my friends this week and they were talking about their memories of him before we started son-rise. How we had to leave everywhere (and how fantastic the girls have always been, never complaining). The day i had to call my mom because i couldn’t get him out of a play area. Biting the furniture at play groups. Three of us trying to get him in a pushchair mid tantrum and failing. His 2nd birthday party when he spent the whole time in the play house on his own opening and shutting the door. Feels like a different life. Probably it was. Full time school was Henry’s decision. He said he was ‘grown up enough now’. So we trusted him and so far i think he was right! His parents evening was a delight. Henry sat on a chair with his legs crossed listening to it all! His teacher said he has settled in really well and you wouldn’t know it was his first time doing full time. All the support is working out for him and he is making great progress academically and socially. His speech seems to be much more fluid and very age appropriate (unfortunately!!!). In fact he just seems to have grown up so much over the summer. We’re at the point where we are looking at making changes to the play room. He just seems to have outgrown it. Carolina i think told us that the child leads the way and he has. This summer was the first once since we started the programme that we had a complete break. When we had a break before you could tell by his behaviour but this time he has stayed pretty level which is a huge difference. We do still have to be careful in how we manage him and are really aware that with school he can be easily overloaded so we only really do things he likes, not supermarkets or shopping, and give him lots of down time. He has started to call saturdays, pyjama saturday! I did take him into sutton yesterday to buy his friend a birthday present which of course he was fine with. When i took the opportunity to get some clothes shopping in for him i pushed it a bit far! Its also not helpful to give him lots of choices or information about things at the end of the day, and i have felt like kicking myself on many occasions for doing exactly this. Sleep and getting to sleep is still where his anxiety comes out but I really think it must come out somewhere because in the rest of his life he manages so,so well.